Now that you’re engaged and probably set to dash out and go venue scouting, allow us to give you a reality check. Finding a wedding venue in Koregaon Park, Pune can be quite daunting given the numerous beautiful sites you will come across. With each wedding venue magical than the other, the wedding planning process is sure to get extremely overwhelming than expected. With Weddingz venue crew by your side, our efforts are always centred to make your planning as effortless as possible. 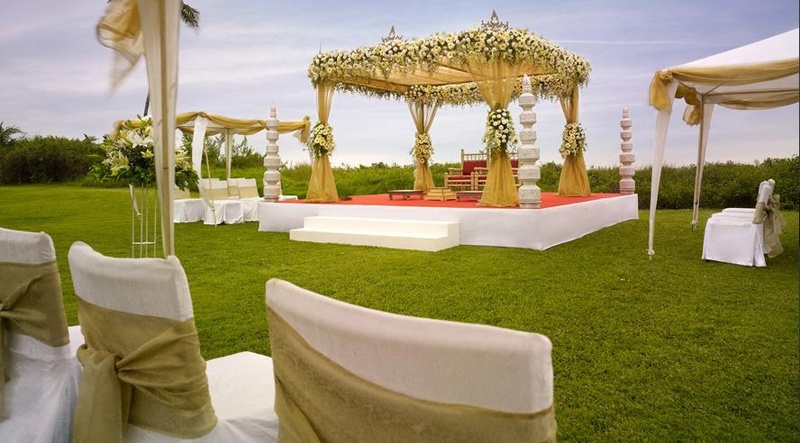 So, read to find out which are the popular wedding lawns in Koregaon Park, Pune that are perfect for a summer or winter wedding. However, keep a rain-check in mind for those unpredictable blessings from the heavens above. Why go for a wedding lawn? Banquet halls have become too traditional and yawn-worthy. For couples looking to celebrate their union a little differently, an open air space is an absolutely stunning and fantastic choice for a gala celebration. Wedding lawns give you a big space to throw a lavish party with over 2000 guests in tow. If you’re looking to take your celebration a hundred notches higher, take a look at these top 4 wedding lawns in Koregaon Park, Pune that are good, better, best and luxurious. Your never ending guest list meets its suitable venue match at the Raga Lawns. One of the most beautiful wedding lawns in Koregaon Park, Pune, Raga Lawns provides over a 45,000 sq. ft. of event space. Whether it is 200 or 2000 guests you wish to entertain at your wedding, Raga Lawns will not disappoint. Their well-manicured lawn can be divided into two sections depending on your pre-wedding and wedding reception size and capacity. Their lawn also features a hard floor area should you need a space to shake a leg at your sangeet party. Changing room provisions are available. The venue permits outside decorators, caterers and DJ at the venue. One of the most picturesque wedding lawns in Koregaon Park, Pune is the Rohi Villa Palace. Nothing beats this event space when it comes to comfort, convenience and exceptional service. Backed by a team of 100+ creative minds, they ensure your wedding celebration is just the way you envisioned it to be. From conceptualization to execution, their staff will take care of every little detail of your celebration. The venue offers a banquet hall attached to the wedding lawn, you can book either or both depending on the size of your celebration. A huge open space around the foyer is the large parking space offered by the venue. An Egyptian style outdoor architecture welcomes you at the Showtime Lawns. Giving you the feel of nothing less than royalty, this wedding venue is an ideal choice for couple who have an extravagant wedding on their mind. With a plush green lawn that can house more than 2500 guests with ease, what more does one need?! Their culinary experts can customize a lavish spread for you. However, the venue doesn’t restrict you from making your own arrangements. Though their efficient decorators solely look after your decor requirements ensuring the space is beautified just the way you like it. Ample parking space is available. Looking for 5 star wedding lawns in Koregaon Park, Pune? The Westin is one of the luxurious wedding venues offering exquisite indoor and outdoor event spaces that will stun your guests. Should you want to host a monsoon wedding outdoors, their lawns are covered using white canopy enclosures with accentuated lighting transforming it into a chic and elegant party venue. Their in-house expert chefs prepare delicious multi-cuisine meals helping you strike-off another major concern from your wedding planning list. Décor arrangements too are handled by their in-house staff, but the venue doesn’t stop you from hiring your own decorators, as well DJ. Not impressed with any of the above? Here are some more marriage lawns and wedding hotels in Koregaon Park, Pune that could interest you. If looking for wedding lawns, marriage halls or AC banquet halls in Pune, we’ve got some amazing venues listed with us too. Browse here.